.BUZZ AUCTION EXTENDED TO 23:59:59 UTC TODAY! 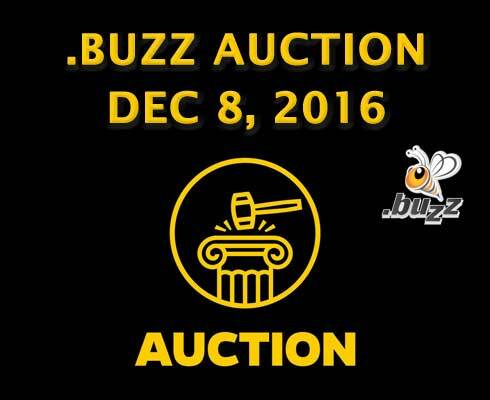 On December 8th, 2016, dotStrategy Co. (the company that owns the .buzz Top Level Domain (TLD) will go to auction. This is a great opportunity for anyone who missed the first ICANN round of new TLD applications to get their hands on a TLD or alternatively, for existing TLD owners to add .buzz to their portfolio. A press release on the .buzz auction was released on November 2, 2016 and can be found here. All bids need to be received by 12:00 (noon) Dec 8th, 2016 Pacific Standard Time. All bids received by email/fax will receive a confirmation. To ensure all participants receive the same information, all questions and answers will be shared equally with all participants. For any questions or inquiries, please contact me directly either via email (christa (at) dottba.com) or the contact form. Article by Michael Berkins dated Nov 2, 2016 can be found here. Please note, since this time, registrations are now at 10,750 which is approx. $325/name. This is below the $338/name .xyz offered Rightside for four less buzzworthy TLDs with a total of 10,000 registrations but was quickly declined.